How do you improve upon something so revolutionary that it changed the world? iRig 2 is the answer. In 2010, for the first time ever, the original iRig allowed guitar and bass players to plug into their iPhone and use their mobile device to play, practice and record with apps like IK's AmpliTube, Apple’s GarageBand and thousands more. iRig 2 builds upon the success of its predecessor by introducing essential new features — like adjustable input gain, cross-platform compatibility and a 1/4" amplifier output — that will once again revolutionize the way you make your music while on the go. Now everyone can plug in their guitar, bass or other instrument and enjoy killer tone on their iPhone, iPad, iPod touch, Mac or Android device — with the release of iRig 2, the world’s most popular guitar interface is now better than ever before. If you loved iRig's versatility, you'll love iRig 2's new adjustable gain dial, which works with its built-in 1/8" TRRS output connector to give you a true plug-and-play experience with your iPhone, iPad, iPod touch, Mac or Android device. Volume levels vary from instrument to instrument and from device to device. And while the original iRig provided superior sound, it was limited in that you were unable to customize the input gain level to your particular setup. With iRig 2, you get an input gain dial that gives you the power to ensure high-quality sound in every situation. This means that you'll be able to perform at your best no matter whether you're connecting a wailing 3 humbucker electric guitar to your Samsung Galaxy Note 4 or a jazzy archtop to your iPhone 6. Likewise, its 1/4” instrument input works with your guitar, bass or any line-level instrument. Just plug into it like you would into a stompbox or amplifier. It’s as simple as that. Want to take it to the stage? 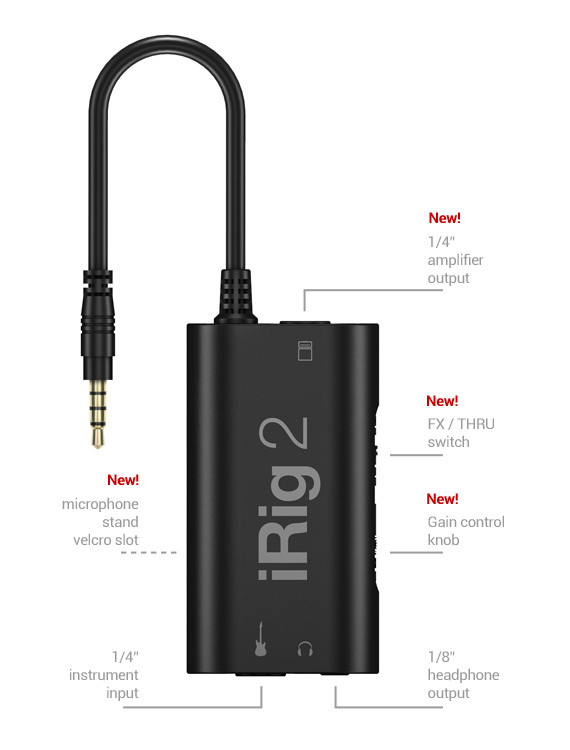 iRig 2's new 1/4” output jack lets you use iRig 2 with an amplifier as a part of your live rig without the use of an adaptor. This opens up a whole world of opportunities when paired with AmpliTube for iOS, IK's powerful guitar and bass multi-effects processor. It provides you with a vast library of meticulously modeled virtual stompbox effects, amplifiers and other gear that you can use as a part of your physical rig when you're jamming with friends, at a practice session, in the recording studio or performing live. Or, if you want to be discreet, plug your headphones into the included 1/8” headphone output. Even better is that iRig 2 features a switch that lets you select between a processed signal and a clean "thru" input signal. This means you can also use your mobile device as a tuner, recorder or other tool while preserving the purity of a 100% analog signal path. iRig 2 is there to help you make your practice and performance sessions as easy as possible. It comes with a microphone stand mount and Velcro strip that allow you to easy attach it for performance alongside other convenient tools like IK's iKlip range of mic supports for all sizes of smartphones and tablets. 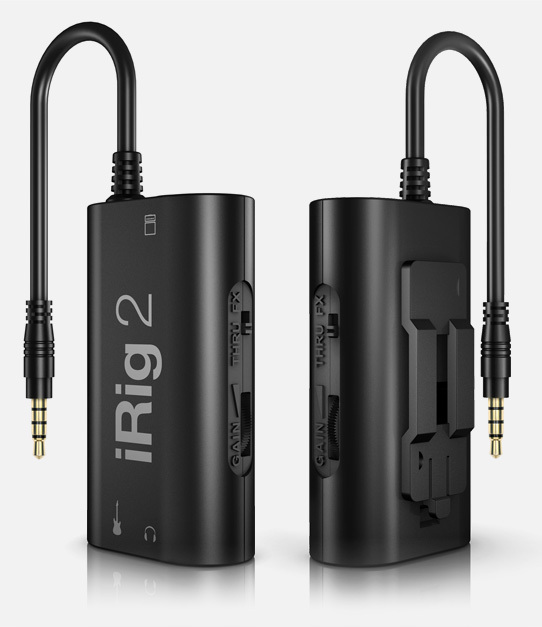 iRig 2 now also offers compatibility with Android 5 devices. As the most convenient way to bring a guitar signal into a mobile device, it lets musicians use the hundreds of available tuning and recording apps available, such as the forthcoming UltraTuner for Android. 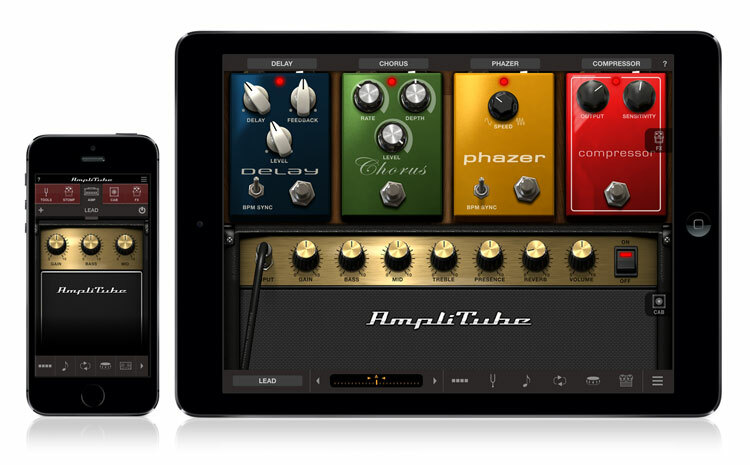 With iRig 2, you’ll be able to enjoy AmpliTube for iOS (the #1 app for guitar players). It's ready to go right out of the box. It comes with a powerful cross-platform suite of apps and software that includes free versions of AmpliTube for iOS and AmpliTube for Mac/PC. 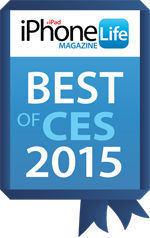 To use, just download your preferred version for iOS from the App Store. Then plug your guitar or bass into iRig 2, plug your amplifier or headphones into your device and launch the app. Immediately you'll see something very familiar: a complete guitar rig. AmpliTube for iOS recreate your entire guitar or bass signal chain in your mobile device and also — depending on your device — provide you with other advanced features, like multi-track recording and editing, high-quality export and more. And while iRig 2 is the ideal companion to AmpliTube for iOS, it also works with any other recording, processing, tuning or music app. AmpliTube is always growing, and we add great sounding and fun new gear models on a regular basis. The in-app purchase feature lets you expand your AmpliTube app whenever and however you want. You can start your journey into this universe of tone with AmpliTube CS for iOS, and then add to your collection of gear at your own pace.